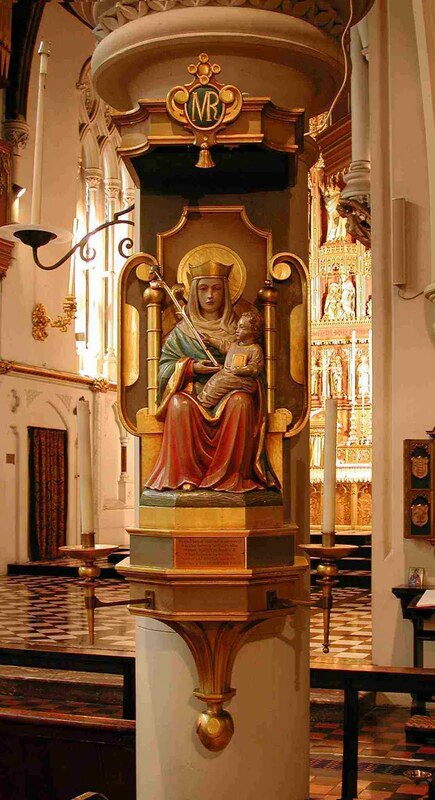 All of 14 months since the Vatican announced a historic opening to welcome Anglican groups into full communion, in the same hour that the three former "Flying Bishops" of the Church of England's Anglo-Catholic wing are being ordained to the Catholic priesthood in Westminster Cathedral, the Holy See has announced the establishment of the Personal Ordinariate of Our Lady of Walsingham. Comprising former Anglicans in England and Wales who'll be permitted to maintain much of the liturgical and (lay-heavy) administrative tradition of the Canterbury communion, the first-of-its-kind structure has been placed under the patronage of Blessed John Henry Newman, with the Pope naming the youngest of the ex-prelates -- now Fr Keith Newton, 58 -- as the founding Ordinary. This morning's ordinations of the founding trio were performed by the UK's most-prominent prelate, the English primate Archbishop Vincent Nichols of Westminster, whose homily underscored that "today is a unique occasion marking a new step in the life and history of the Catholic Church. 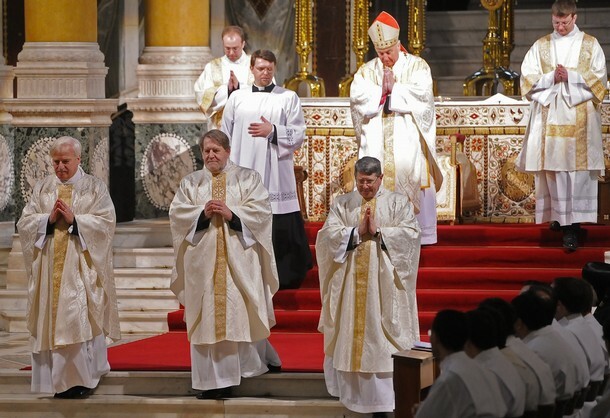 "Many ordinations have taken place in this Cathedral during the 100 years of its history," the archbishop added. "But none quite like this." Among the many to he thanked for helping make the moment possible, Nichols listed among them the archbishop of Canterbury Rowan Williams for "his characteristic insight, and generosity of heart and spirit" in wishing the new priests well on their journey across the Tiber. While the Westminster auxiliary Alan Hopes -- the first former Anglican cleric in recent times to be ordained a Catholic bishop -- was initially expected to lead today's rites (as he did Thursday evening in making deacons of the three ex-bishops), in another sign that, appearances aside, this was anything but a typical ordination, Nichols stepped in to represent Cardinal William Levada, the prefect of the Congregation for the Doctrine of the Faith and B16's designated overseer for the Anglicanorum project. Unable to be present due to a trip to India to meet with the country's bishops, in a message read at the Mass, Levada extended the pontiff's blessing to the new priests and the witnesses to the day, telling the founding members of the new ordinariate that "in the midst of the uncertainty that every period of transition inevitably brings, I wish to assure you all of our admiration for you." A daughter of the freshly-named ordinary (above, giving a blessing at Communion) proclaimed one of the readings at the Mass, and in the rite's emotional high-point, the new priests' vestments were brought forward by their wives. 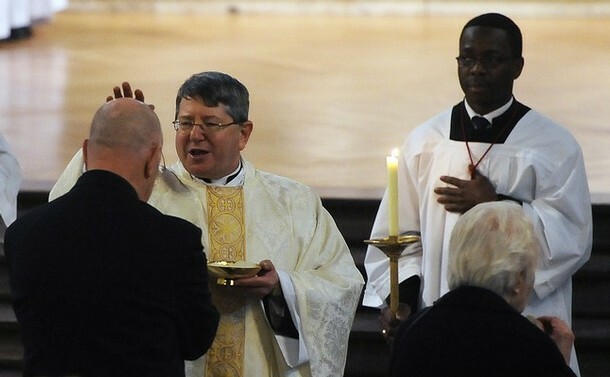 Beyond the roughly 35 parish groups and 50 priests slated to make the journey into the English ordinariate over the coming months, two more Anglican bishops will be ordained Catholic priests by early March. "God Stands By Us, Walks With Us, Holds Us"